Impressive statistics and a long list of awards aren't what defined Joe Sakic during his illustrious 20-season career. His will to win and determination did. He's the eighth all-time leading scorer in NHL history with 1,641 points. He's one of only 17 players to have scored at least 600 goals, and one of only 11 to have recorded over 1,000 assists. He has won two Stanley Cups, an Olympic and world championship gold medal, and a host of individual honours, including the Conn Smythe, Hart, Art Ross, Lester B. Pearson and Lady Byng trophies. And now that Sakic announced his retirement from the NHL on Thursday afternoon, talk will undoubtedly turn to his inevitable first-ballot induction into the Hockey Hall of Fame. But impressive statistics and a long list of awards aren't what defined Joe Sakic during his illustrious 20-season career with the Quebec Nordiques and Colorado Avalanche. His will to win and determination did. "Nothing impressed me more about Joe than the sheer drive he displayed every time he took to the ice," Marc Crawford, now coach of the Dallas Stars, told CBCSports.ca. A first round pick (15th overall) of the Quebec Nordiques in the 1987 NHL draft, Joe Sakic's hockey career was nearly derailed as a junior player. Sakic scored 60 goals and notched 133 points for the Swift Current Bronocs in 1986-87, winning the Western Hockey League's rookie of the year award. But Sakic nearly lost his life earlier that same season. On Dec. 30, 1986, Sakic and the Broncos were driving to a game against the Regina Pats, when the bus crashed after the driver lost control on a patch of black ice outside of Swift Current. Sakic was unharmed, but four of his teammates died. Crawford should know, having coached Sakic for four seasons and winning a Stanley Cup together in 1996. Calling him a natural leader, Crawford said Sakic had a great hockey mind, and understood the game better than most of his contemporaries. "It's funny, because I never felt I really coached him; it was more like I collaborated with him," Crawford explained. Possessing brilliant hockey instincts, Sakic went about his business in a workmanlike fashion, becoming one of the premier players in the NHL in the process. Playing against him was no picnic, according to former Edmonton Oilers forward Craig Simpson. "You always had to be aware where he was on the ice. You had to play hard against him every single shift," said Simpson. "He had the ability to raise his game and play with intensity, but still do so many amazing things." He was also a goalie's worst nightmare. "Even if he wasn't on the ice, I always had a thought in my head that I had to watch the bench and see when he might be coming back onto the ice. His presence was felt for the full 60 minutes of every game," said ex-Los Angeles Kings netminder Kelly Hrudey. Named team captain in 1992, Sakic is regarded as one of the seminal team leaders in NHL history, noted for his ability to motivate teammates simply by playing at a consistently high level, no matter the circumstances. "Intensity is something that can show up in many different ways. The drive that he had to not be intimidated … he was the type of player that every single team would put a game plan together to try to stop him," said Simpson. "So, every single night he had to play tough, hard minutes and he had to go against the checking line, and I think that's a sign of a great player: his ability to do whatever it takes, take the hit to make a play, to never stop and never be happy that he accomplished anything." "He didn't talk a great game, he played a great game," offered Hrudey, adding that Sakic "never took a shift off." Sakic's mesmerizing displays weren't limited to NHL rinks. The Burnaby, B.C., native was also a loyal Team Canada servant, representing his country in several international tournaments. The shining moment of his international career came at the 2002 Winter Olympics in Salt Lake City where he helped Canada win its first gold medal in 50 years. 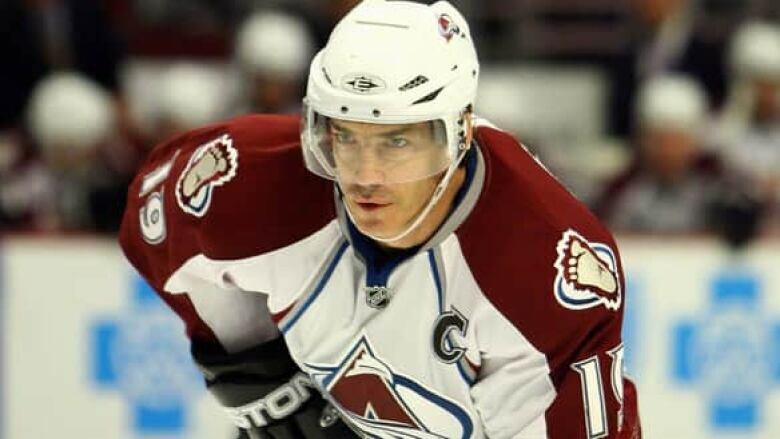 Sakic was named tournament MVP, but also won universal praise for his selfless play and for taking a lesser role on a team littered with super stars such as Mario Lemieux, Jarome Iginla and Steve Yzerman. "He came, he showed up and he played wherever they wanted him to play, and he did what he had to do to help the team win," Simpson said. All good things come to an end, though, and after missing the majority of last season with a series of injuries, Sakic, 40, has called it quits. That he's decided to walk away from the game on his own terms, even though he could probably play a few more seasons in a reduced role, speaks volumes about his character. "I think it's safe to say that he probably has three to five years left in him, but it's pretty impressive at this point that he's chosen to say goodbye," Hrudey said. "His standards are so high, and it's kind of cool to see a guy like that to decide to retire [because of his] high personal standards."